A Thief in the Night: Results from NCW’s March Madness! Northeast Championship Wrestling returned to our home at the Norwood Elks Lodge this past Friday night for NCW’s March Madness, an event that saw the Ox Baker Memorial Cup Winner Triplelicious steal the NCW Heavyweight Title from “RIOT” Kellan Thomas during their Championship Match. 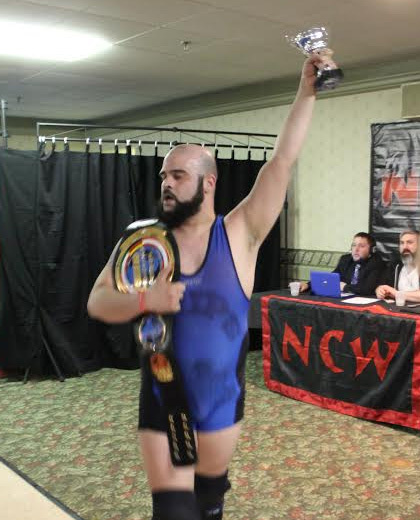 Click Here for pictures from NCW’s March Madness courtesy of Dave Rodrigues. – NCW 2014 Rookie of the Year Christian Casanova d. the former Legion Cage Kenny Banks in the night’s opener with a victory roll, barely outmaneuvering the talented ring veteran. – NCW New England Champion Rob “The Giant” Araujo defeated “Ruthless” Ruy Batello following a well-timed save from The Lumberjake, who distracted Ruy long enough to allow Araujo to dive off the top rope and sandwich Batello down for the three count. NCW Commissioner Dean “The Beast” Livsley came out, thanking the fans for coming out to March Madness, despite the snowy first day of Spring. Livsley announced that originally the Tag Team Invitational was scheduled to be four teams, but with “Bam” Brandon Behm’s knee injury in Pembroke, The Underground Anarchy was being pulled from the match. With the match changing to a Triple Threat Match, the contest would be a non-title match. – NCW Tag Team Champions The Loomis Brothers (David & Eddie Loomis) defeated Crossfit (“The Prettiest Man” Derek Andrews & “The Mastodon” Brick Mastone) and The Heavy Hitters (Frank Champion & Shay Cash) when Eddie Loomis pinned Derek Andrews. As Champion & Cash stared down the Champs, Mastone, who was filling in for “The Fittest Man” Dan Terry attacked David Loomis after the match, nailing him with a vicious spear. It then took Eddie Loomis TWO bicycle kicks just to take Mastone off his feet in a tremendous display of strength. – “The Native American” Tomahawk d. “Dastardly” Doug Summers w/ Ashley Vox in a great back and forth match with a devastating chop off the top rope. – The Lumberjake w/ “The Showoff” Mike Paiva d. “Slamdance” Tim Lennox w/ “Black Magic” Sean Feeney with a giant ‘musclebuster’ with Lennox perched on the top rope. With Jake’s win, Mike Paiva would get “Black Magic” Sean Feeney one on one. – “Black Magic” Sean Feeney d. “The Showoff” Mike Paiva after utilizing a pair of brass knuckles behind the referee’s back. Lumberjake was quick to chase Lennox out of ringside, but with everyone distracted Ruy Batello returned to the ring, laying out Paiva with a vicious ‘Portuguese Drop’. Though Paiva was able to barely kick out, the cheating of The Underground Anarchy and Ruy Batello proved to be too much for “The Original Showoff”. – NCW Heavyweight Champion “RIOT” Kellan Thomas w/ Kepler d. Triplelicious by DQ when Trip nailed Thomas with the Heavyweight Championship belt after Redd Roche tried to stop him from leaving ringside with the NCW title. The Ox Baker Memorial Cup Winner then stole the NCW Championship, immediately leaving the building before “RIOT” even realized what happened. Previous Post48 Hour Special! NCW Back to SchoolNext PostWatch The Avengers: Age of Ultron w/ NCW April 30th!